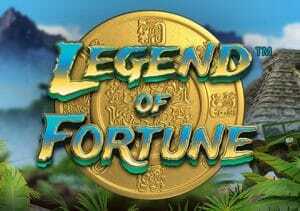 Go on a quest for lost jungle riches in Legend of Fortune, a 5 reel, 20 payline video slot from WMS and Red 7 Mobile. Played using a 5 reel, 20 payline game engine, it comes with plenty of extras including free spins with wild extras, free spins with collapsing reels and a trail bonus where your payout is boosted by up to 40x if you manage to reach the end. Stakes range from between 20p and £20 per spin. The design here is fairly typical for an WMS game – with mist shrouded, hillside jungle pyramids in the background, you’ll see royal symbols alongside frogs, swords, journals and toucans. The Legend of Fortune logo is the most rewarding symbol, offering awards of up to 10 times your bet per payline. The compass is the wild. As we mentioned in the intro, there’s a good variety of extras on offer here. Death Room Wilds feature – this bonus can hit at random on any spin. The walls will squeeze out the symbols from one of the reels. When the walls expand again, that reel will be filled with wilds. A respin is then awarded with the wilds locked in place. If that respin doesn’t result in a win, the process is repeated and another reel turns wild. These continue until you land a winner or the walls meet. The first reel to turn wild is reel 5. Then it’s reels 1, 4, 2 and 3. Temple Run Free Spins feature – 8 free spins are awarded here with some potentially exciting extras. The Poison Darts add trails of wilds and the Falling Spikes turn whole reels wild. The Pit of Surprise can awarded free spins with colossal 3×3 symbols. Cave-In Free Spins feature – land this and you’ll receive 10 free spins. The base game engine is replaced here by a collapsing reels set. Stepping Stone feature – navigate your way along a path of stones, collecting prizes as you go. The further along the path you make it, the bigger the prizes on offer. If you reach the final stone, you’ll get to spin the wheel which boosts your payouts from this round by up to 40x. We found plenty to like in this treasure hunting adventure. The visuals aren’t quite from the highest echelon but do the job perfectly well. It’s a similar story with the features. They offer a nice variety which keeps the pace moving. Legend of Fortune is a well-constructed game, combining classy design with some playable extras. If you fancy awakening your inner Indiana Jones, then Legend of Fortune is a pretty good place to start. Alternatively, Playtech’s Legend of the Jaguar is a better video slot.